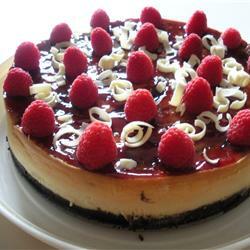 Make this creamy white chocolate raspberry cheesecake. Prepare ahead - takes 8 hours or overnight to refrigerate and set. Preheat oven to 325°. In a metal bowl over a pan of simmering water, melt white chocolate chips with half-and-half, stirring occasionally until smooth.